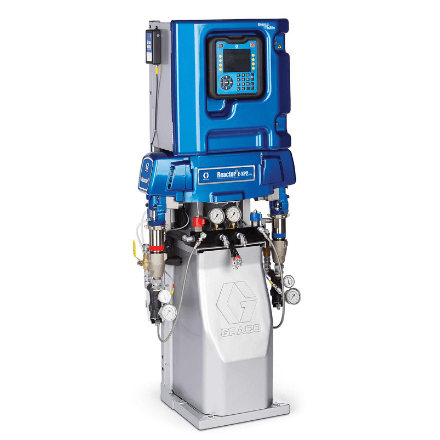 Graco’s hydraulic Reactor H-XP2 brings increased yield and high output spraying. Ideal for in-plant OEM’s or applicators that spray at high volumes. Count on the Reactor 2 E-XP2 proportioner for advanced technology in applying fast-curing polyurea coatings. Because it’s a Reactor 2 series proportioner, it offers software and hardware enhancements for better spray performance, plus technologies that add to your bottom line. The Reactor 2 E-XP2 is engineered to process and spray polyurea and other coatings that require high pressures. The hybrid heater and heated hose condition the materials to the right viscosity prior to mixing. Quick knockdown lower pump for easy maintenance, easy-to-use controls, and rugged design make the Reactor the preferred choice for coatings applications. All Graco Reactor 2 E-XP2 documentation, manuals and resources available HERE.